Last week Clearmatics hosted a hackathon for its Ion blockchain interoperability protocol at Barclays Rise in London. Although it sounds like a corporate affair, a four-student team from Bedford School landed third place. What’s even more surprising is that until two days before the event, none of the 17 and 18 year-olds had any blockchain technology experience. Despite this, they managed to set up blockchain networks, install software, develop a project, present it, and even raise some technical issues re the open source code which were nick-named “Bed bugs” by Dr. David Wild, their maths and computer science teacher. Wild wanted to put his students in a scenario outside of their comfort zone. One that would make them think, use their interpersonal and coding skills and also develop an appreciation for coding beyond bite-sized 45-minute lessons. “It’s about much bigger problems, and being part of a jigsaw of people that need to fit together in order to produce a solution that’s coherent and well presented,” Wild elaborated. The teacher likened the situation to a cross between the Dragons Den TV show (or its U.S. equivalent, Shark Tank) and a job interview. As with any good blockchain use case, their solution addresses a real need. Multiple exam boards deliver school exam results, and the results arrive in different formats which schools need to collate and pull into their own systems. The objective of the Ion protocol is to enable separate blockchain networks to interoperate with each other. Imagine that each exam board has its own blockchain network used to share data with schools. There’s a student smart contract that collects student results. 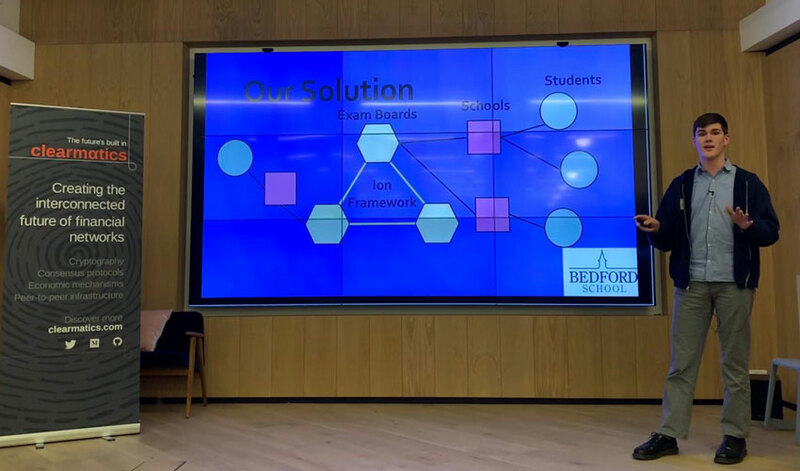 So each exam board blockchain has an Ion Framework connection to enable it to interoperate with other blockchains. Using standardized data, when the exam body gets a request and proof that the student is part of their exam body, it then fills in the result for that student on the blockchain. So the smart contract will do the rounds of the exam bodies and accumulate all the results until its fully populated, at which point the school can then load all the student’s results in one go into its back office systems. That sort of mechanism could work in banking and beyond. The student team was one of five hackathon teams. The winning team from Santander integrated an Ethereum blockchain with a Hyperledger Fabric network for a bond issuance solution. The Ion protocol was originally developed for connecting separate Ethereum networks, and more recently Clearmatics has started to work on integrating with Hyperledger Fabric, which enabled Santander to leverage that work. Web3Labs (formerly blk-io) came second for a project that addresses the provenance of reference data, whereby banks submit interest rate data to produce an averaged rate result across all banks. The project, which has been open-sourced, involves interoperability between multiple Ethereum blockchains. The other two teams were Adhara, the fintech startup founded by Julio Faura former Santander head of blockchain R&D, and Barclays which has started to explore how to integrate Ion with R3’s Corda platform. Barclays’ team wasn’t eligible to win a prize because the bank was providing the hackathon venue. Stepping back, why is interoperability so important in financial services? The answer lies in the Santander bond issue solution. In the near future, there will be blockchains for many types of digital assets like commodities, stocks, bonds, derivatives and digital versions of fiat currencies. For some asset classes, it’s already happening. If an asset is bought or sold, the optimal solution is to use digital cash for payment, and the cash could potentially live on another network. Instant payment, or an “atomic swap” is ideal to minimize the risk of non-payment. And a significant part of financial market infrastructure revolves around mitigating this risk. The widespread use of low-risk Central Bank Digital Currencies for the payment leg appears a way off. In the interim 17 major financial institutions have teamed up with Clearmatics to create the Utility Settlement Coin backed by deposits held at a central bank. The project is likely to launch next year. Although the group has since expanded, the last publicly announced list of participants was Barclays, BNY Mellon, Canadian Imperial Bank of Commerce, Credit Suisse, Deutsche Bank, HSBC, ICAP, MUFG, NEX, Santander, State Street and founder UBS. And that benefit could spread beyond the USC because the Ion Protocol has been open sourced as part of Clearmatics’ open source roadmap. So the hackathon was an opportunity to build the community and get condensed feedback on both technical aspects as well as documentation. “You understand things from an internal perspective, but as soon as you get external eyes on it, they point out things that you didn’t see, and that’s good, that’s positive,” said Sara Feenan who heads product strategy for Clearmatics. Next Article Monero (XMR) To Have Another Hardfork?